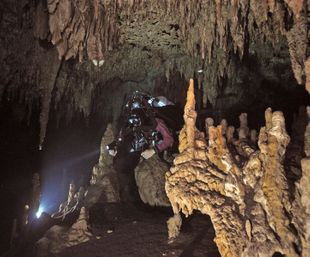 The unique underground water system of the Riviera Maya in the state of Quintana Roo in the Yucatan Peninsula of Mexico has made this area a diver’s Mecca for cavern and cave diving since 1987 when exploration of Dos Ojos started. In the jungles nearby Tulum lie the three longest underwater cave systems (Ox Bel Ha 238 km; Sac Aktun 215 km; Dos Ojos 82 km) known on earth. The coastal region has over 100 different cave entrances and miles upon miles of passageway...most of it is just spectacularly beautiful! According to the diver's certification and experience, so will be the diving. With more than 500 miles (800 km) of guide lines, the area offers an unlimited number of cave dives for divers with technical certification of Full Cave. From the famous Room of Tears in Carwash, the Chinese Garden in Tajmahal or the Cuzan Nah circuit in Sac Aktun, to the traverses of Dos Ojos, Naharon-Mayan Blue, Ponderosa-Chikin Ha, Kalimba or the visit to the incredible mammoth bones in Tuxchcupacha. We also offer new dive sites like Chen Hol or the more recently accessible ones like The Pit and the Dirty Dog. Why seeking a professional cave diving guide? As a certified cave diver, you know that a guide is not compulsory to perform cave diving. However, we highly recommend that you consider hiring a professional cave diving guide who is familiar with all the cave systems and knows how to make the dive safe and pleasant. Considering that your stay is limited to a few days, there is only so much you can do during that brief time. Realistically, it would take you months if not years to tour and explore all underwater caves of the Riviera Maya...and, as you can imagine, some caves are better than others. So, if you wish to see the best caves, it is wise to use a guide who can decide where to go that suits your interest and level of ability instead of you wasting your valuable time and air searching for the main permanent line, or the offshoot line to a particular passage or room, or going the wrong direction. Our knowledgeable and competent guides can take you straight to specific locations or areas in the cave system giving you the opportunity to see the best of what the cave system has to offer. Another reason for seeking a guide, and which we believe should also be a major concern of all cave divers, is to help protecting the fragile underwater cave environment. Cave divers who are not familiar with the cave system can inflict needless damage to the cave environment. Diving into dead-end areas anywhere beyond the main passageways is an unnecessary risk and burden to the fragile cave. Our guides, having the knowledge and experience of every cave system, allow you to tour and explore each cave system with minimal impact on it. We hope the above reasons will help you in your decision-making. Our guides are always available to make your diving safe and pleasant. The decision to make your dives enjoyable, relaxing, and productive is yours! When visiting the cenotes, please consider yourself a guest and act accordingly. We must show respect and be careful while diving underwater and walking around on the land’s surface, particularly near a dive site. The fragile biological life, formations, and archaeological history are there for the diver’s interpretation and enjoyment. Divers should leave the cenote the exact way they find it. That’s why, take only memories, kill only time, and leave nothing behind, but bubbles! !